There’s a lot of things I have been putting off for ‘tomorrow’. But then you know what they say about tomorrow, right? Yes, it never comes! The point is that these are important things that I can’t afford only to worry about. I need to get off my behind and get them done. I wouldn’t have anything to worry about. There’ve been times when I anticipate things and start to worry about how they can be fixed. Worry has sometimes kept me awake – only to make me feel lousy the next day. Worry is truly a waste of time. There isn’t one good reason why we should worry, but plenty of reasons why we shouldn’t. Worry and the resulting stress take a huge toll on our body. One could end up with depression, hypertension, stomach upsets (prolonged anxiety leads to digestive problems), heart ailments and fertility trouble. Worry clearly is BAD for us! Graham C. L. Davey, Ph.D. is Professor of Psychology at the University of Sussex, UK. His research interests extend across mental health problems generally, and anxiety and worry specifically. Read his article – 10 Tips To Manage Your Worrying – here. Why worry when we can do? Why worry about tomorrow, when we should be living fully today? Why worry when we can always find creative solutions or learn acceptance? Why spend timing worrying, when we can spend time being grateful? I too have so many things to do …so many things on my mind Corinne…But there’s no point worrying…I’m planning to get my life on track after my mother’s surgery this week…. The reason for worry we ourselves make.Otherwise as said here for reasons numerous we can remain without worry.Nice. Oh, I worry a lot too and indulge it often despite knowing that it does not lead me anywhere just adds to the stress and wrinkles! But, as you rightly pointed out, it is truly a misuse of imagination. Like they say, today is the tomorrow we worried about yesterday! I was a worrier. But, when I realized that there is really no point in worrying, I have slowly let go of the habit. So, now I try not to worry and look for solutions instead. Very true. Worrying does not solve a problem Too much worrying makes us ill. Corrine, this a great reminder from you that we should stop worrying and start living. I wasn’t a worrier before, but as I grow older and have more adult responsibilities to handle, I find that I worry a lot without reaching any solution to my problem. 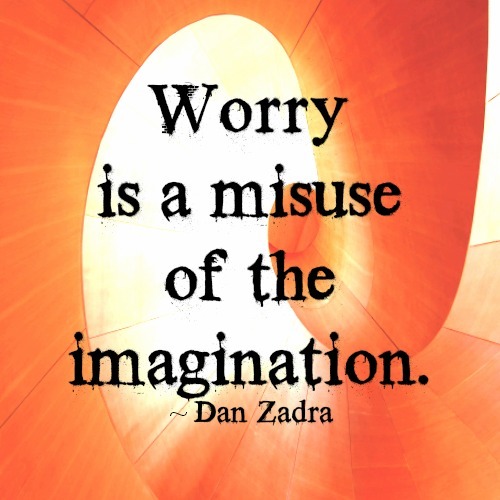 Worry is a misuse of the imagination – that is so very true!! So so true, Corinne! <3 I used to be a worrier until I read and accepted this simple axiom from my guru: "Leave your worries to me. If you worry, I will not worry." I simply adore the fact that you open with it. Do the things that you think about doing, instead of worrying about them. Really need that kick in the seat of my pants today. Thank you! True Corinne,worr is just awaste of time. There have been times when I have woken up in the middle of the night worrying about something or the other. Finally I started making a ‘to do/ to remember’ list before leaving office/ going of to bed. It worked. I could sleep peacefully. Ah worry…it’s been my closest ‘friend’ and worst enemy through most of my life. Anxiety can be so debilitating and yet, when we ride the wave of worry and get on with our lives anyway, life becomes much more meaningful! Totally there with you on this one, Corinne. Worry IS a waste of time and energy better spent living in the present moment. And, as Jesus told us worrying can in no way improve our lives, I don’t need to look further. Blessings, my friend! I wake up and try and remember what I was worrying about the night before 🙂 I am a worrier, glad to know there are more like me 🙂 I am trying to change my thought-processes, one step at a time. Ha ha…nice to forget what you were worrying about, no? Always makes me feel foolish too, but old habits die hard! So, so, SO true! It’s hard not to worry sometimes, but you’re right – it’s a waste of time and energy. Thanks for sharing this perspective.